shows Reg Cooper Square (or Centennial Square) next to City Hall. Looking a bit like a Venetian piazza, the square has a fountain, trees in the planters, and a weed-free look. Gosh, there are people sitting in the square, not just passing through. 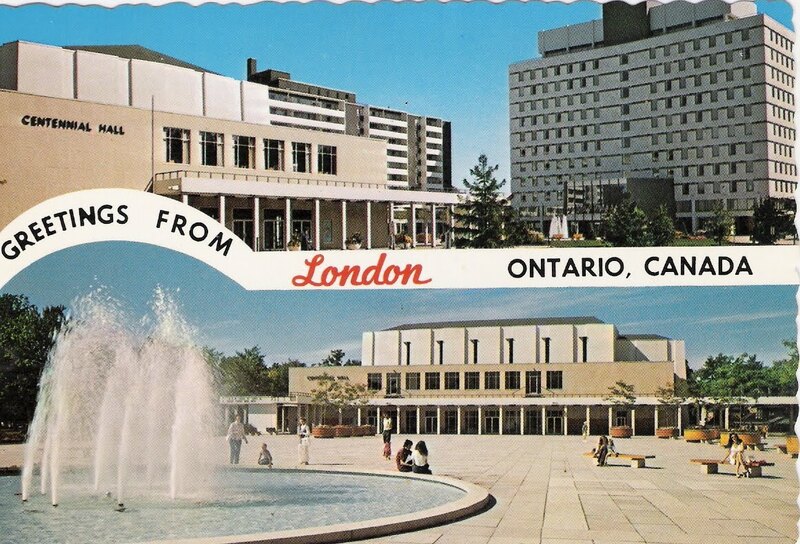 The postcard was published by Victor Aziz Photography, a long-time London business. Wonder if and when the University of Western Ontario (if present discussions play out) and they ultimately do acquire the property shown here for a campus annex, whether they will be doing significant alterations. I'll bet they certainly will...for better and worse. At least maybe they'll have a chance to re-work the awful misconceived original design and plans that never made sense from the start. Does anybody know or remember what was on this Site before it became Reg Cooper Square and London City Hall? How about maybe a little blog entry on that? London's upper classes used to build grand houses around the perimeter of Victoria Park, including the site of present-day City Hall and Reg Cooper Square. Some attractive houses remain along Central Avenue and on Wellington Street north of Wolfe. If you'd been here after 1958, you'd have seen Victoria House, set up as London's first historical museum, on Wellington north of Dufferin. That museum closed in 1965 and was demolished in 1967 to make way for Centennial Hall. Go way back to the 1800s and this plot of land contained military barracks, a continuation of the ones existing across Wellington Street in Victoria Park.